The Red Rocks trail is located in the Denver Mountain Parks near Morrison, Colorado. The trail begins in the Red Rocks Park. Near the 1 mile point the trail leaves Red Rocks and enters the Matthews/Winters Park where after several more miles it comes to an end at a junction with the Village Walk and Village Ride trails. Enroute the trail provides connections with the Cherry Gulch and Morrison Slide trails. 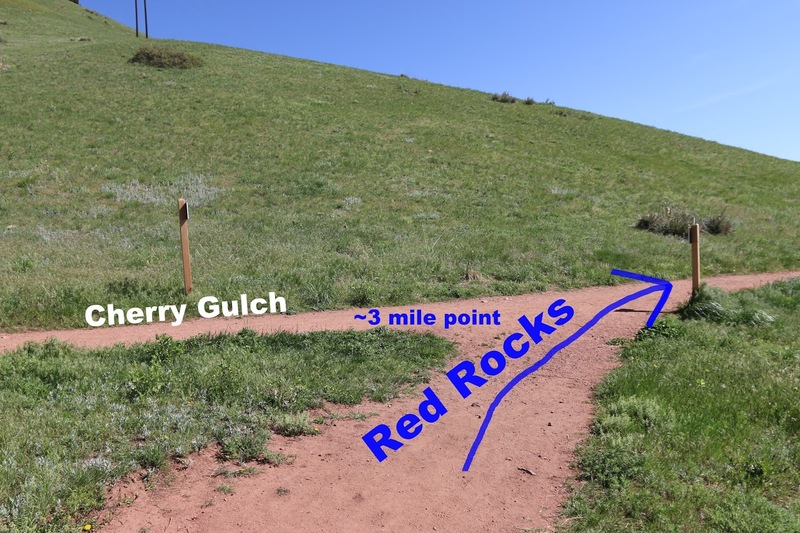 A short spur trail on the Red Rocks Park end also gives access to the Mt. Vernon Creek and Dakota Ridge trails. This post begins at the Lower North Lot in Red Rock Park that is most easily accessed via Entrance 1. The trail itself begins across the road from the northeast corner of the parking area. The trail starts out crossing the large meadowed hillside. The iconic Red Rocks contrasting with the green grass and brush and the azure blue sky lend a peaceful ambience to the hike. As it continues the trail dips down below the hill and turns northward where it passes the point where the spur trail branches off on the right heading towards Entrance 2 where there is a small parking area at the beginning of the Mt. Vernon Creek trail. 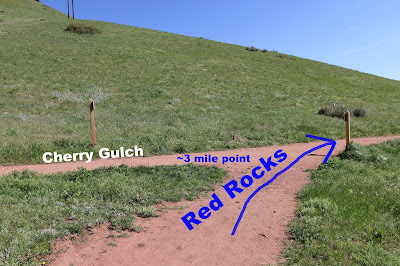 A loop can be formed by crossing the highway and picking up the Dakota Ridge trail and taking that to the Matthew/Winters trailhead and then returning via the Red Rocks trail. After passing the junction with the spur the trail comes up to a small parking area and crosses the access road. Almost 1 mile can be cut off of the total distance by beginning at this parking area. Once across the access road the trail passes far below the Geologic Overlook and near the 1 mile point it leaves the Red Rocks Park and enters Matthews/Winters. The trail becomes a bit more primitive as it picks a secluded route up a small gulch. Just before the 1.5 mile point, below the crest of a ridge, the Red Rocks trail is met by the Morrison Slide trail. At the crest of the ridge the views open up with Dakota Ridge dominating the background on the east side of the highway. 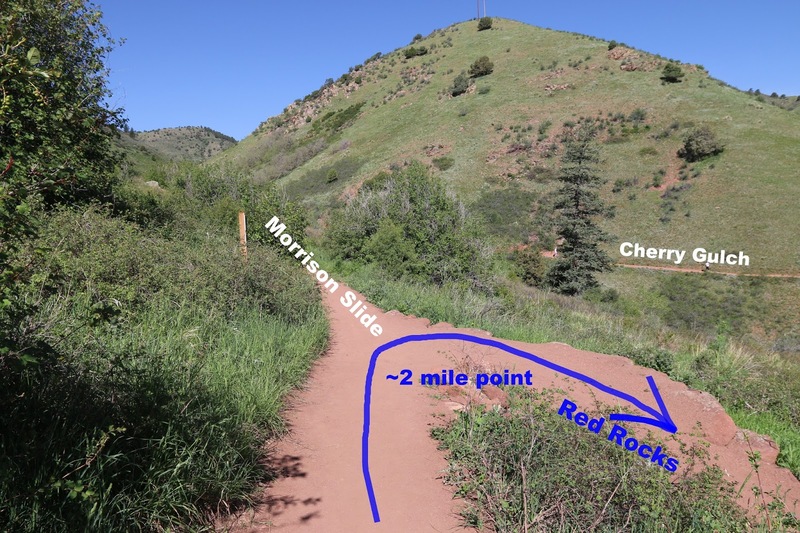 The elevation of the Red Rocks trail changes little as it traverses around the mountain below the Morrison Slide trail. There are some very rocky sections of trail that will keep the mountain bikers awake. A prolific growth of poison ivy also encroaches upon the trail for a very short distance. Just past the 2 mile point the Red Rocks trail turns sharply to the right as it is connected to once again by the Morrison Slide trail. The Cherry Gulch trail can be seen coursing along the hillside in the background. The trail gets pretty easy again after passing the Morrison Slide junction. A few gentle switchbacks take the work out of the elevation changes. Near the 3 mile point Red Rocks comes to a junction with the Cherry Gulch trail. 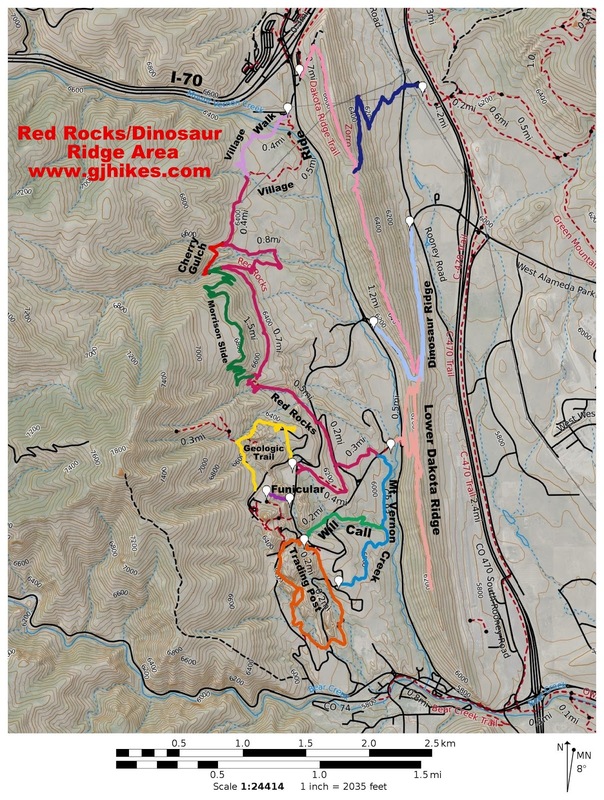 The Red Rocks trail comes to an end when it meets up with the Village Walk and Village Ride trails. From here hikers can follow the route to the left for about half a mile to reach the Matthews/Winters trailhead while mountain bikers are restricted to the trail on the right. Maps are available at the Matthews/Winters trailhead but you can print the Matthews/Winters and Red Rocks maps ahead of time and take them with you. 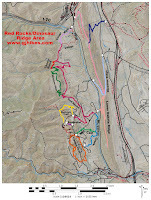 We have also created our own map that combines all of the adjacent trails in the area. The Red Rocks trail gets a lot of use from hikers, mountain bikers and trail runners. Judging from the smiles on everyone's faces the Red Rocks trail is well worth checking out. If you would like to see it for yourself then all you have to do is 'Take a hike'.